DEP MeshWorks graph is a powerful plotting and data analysis tool. It has a rich set of plotting features, a user friendly interface, easy navigation from function to function, and is fully integrated within the MeshWorks interface. Inbuilt math functions are available in the tool, which makes it easy to process mathematical expressions for the plotting of CAE simulation results. 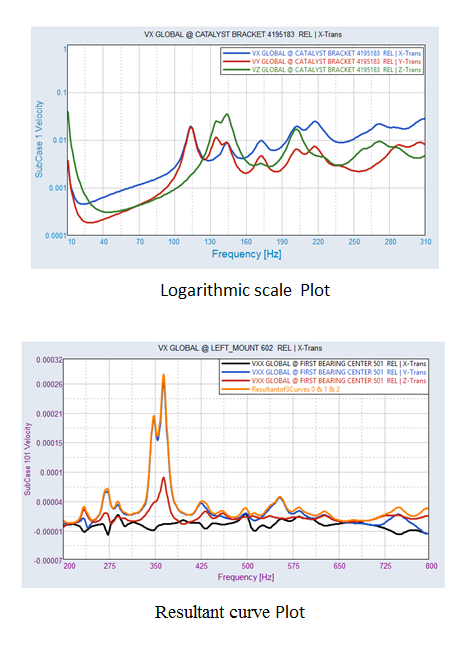 Plot Axes: Allows the user to change linear scale to logarithmic scale. Plot Macro: Allows the user to plot the resultant curve. Coordinate info: Allows user to see the maximum and minimum points of the curves. Legend Attributes: Displays the curve details. The user is then able to change attributes like line style, color, weight. Curve Scale Offset: Allows the user to perform curve scaling, offsets can be applied to multiple curves. Curve Math: Allows the user to create new curves using expressions and values. Header/Footers: Allows user to edit header/footers. Datum Line: Allows user to create line in user defined location in both horizontal and vertical axes. Curve Attributes: Allows the user to define attributes like line style, color, weight, symbol style and color. Graph–Notes: Annotations display the curve details. The user can add notes to provide extra information if needed. Integrated graphing user interface within MeshWorks Pre/Post. Inclusive of Post Processing results from Nastran(*pch) solver output. Multiple Punch files can be appended and used for plotting curves. 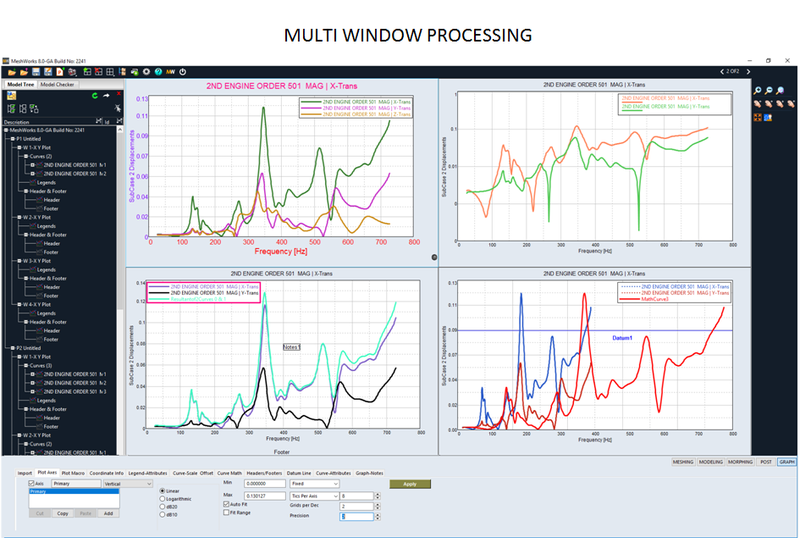 Multi- page and multi- window post processing of results with easy transfer of settings from one window/page to another. XML based session file saving. Session files can be replayed.